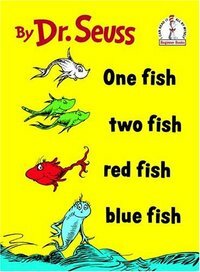 One Fish, Two Fish, Red Fish, Blue Fish is a 1960 children's book by Dr. Seuss. It is a simple rhyming book for beginning readers, with a freewheeling plot about a boy and a girl named Jay and Kay and the many amazing creatures they have for friends and pets. Interspersed are some rather surreal and unrelated skits, such as a man named Ned whose feet stick out from his bed, a creature who has a bird in his ear, and one man named Joe who cannot hear the other man's call. As of 2001, over 6 million copies of the book had been sold, placing it 13th on a list of "All-Time Bestselling Children's Books" from Publishers Weekly. Based on a 2007 online poll, the United States' National Education Association labor union named the book one of its "Teachers' Top 100 Books for Children." Rik Mayall narrated this story as part of a HarperCollins audiobook that also includes The Lorax, Dr. Seuss's ABC and How the Grinch Stole Christmas!. One Fish Two Fish Red Fish Blue Fish was part of the Beginner Book Video series which included Oh, the Thinks You Can Think! and The Foot Book. A book titled One Dad, Two Dads, Brown Dad, Blue Dads was published in 1994, a parody of the title. In the Supreme Court case, Yates v. United States (2015), Justice Elena Kagan cited the book in her dissent to support the argument that fish are tangible objects as defined in the Sarbanes-Oxley Act. The title of the 1991 episode of The Simpsons "One Fish, Two Fish, Blowfish, Blue Fish" is a clear parody of the title. The song "One Thot, Two Thot, Red Thot, Blue Thot" by rap artist Yung Gravy references the story in its title, swapping the word fish for thot. Entrance of the One Fish, Two Fish, Red Fish, Blue Fish ride at Islands of Adventure. The book was the basis of a theme park attraction located at Universal's Islands of Adventure in the Seuss Landing area of the park, called "One Fish, Two Fish, Red Fish, Blue Fish". ^ The literal English translation of the Hebrew title is Strange Things Happen in Books. ^ Valentine, Johnny; Sarecky, Melody (1994). One dad, two dads, brown dad, blue dads. Boston, MA: Alyson Wonderland. ISBN 1555832539.